Vienna – no other city combines history and modernity in such an imposing way. As unique as the city itself, as impressing is “The Imperial Riding School Vienna, A Renaissance Hotel”. Built in 1850 as an imperial military riding school under Emperor Franz Josef I, the neoclassical building offers today every imaginable comfort. 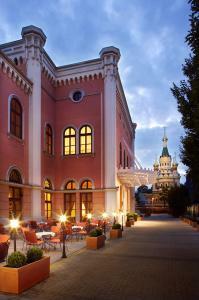 The hotel is located in close proximity to the baroque Belvedere Palace. The Ringstrasse and the city center are within walking distance.Designed in a contemporary style, all 369 spacious guest rooms and suites offer the perfect atmosphere for both concentrated work and undisturbed relaxation. A very special highlight is the 2.000m² lush green Renaissance Garden Club. The generous garden area can be booked for a variety of events and social occasions. Our City BBQ is the main attraction between May and September. Enjoy our barbecue specialties or be your own BBQ chef. The Renaissance Garden Club directly adjoins the beautiful winter garden of our restaurant Borromaeus from which you can enjoy the garden view even on cold days.Let us spoil you at our Imperial Club Lounge and enjoy personal service in a private ambiance. Three individual designed VIP meeting rooms as well as the show kitchen “Maestoso” make the Imperial Club a unique experience in Vienna!Our exclusive Imperial Club offers 26 club rooms and 4 maisonette-suites leaving nothing to be desired. All rooms are furnished with the new Renaissance Design and provide a 32 to 47m² living space on the highest comfort. Over 1.400m² of total meeting space offer the perfect frame for a meeting, seminar or a splendid wedding for up to 500 guests. All meeting room offer natural daylight and are equipped with state-of-the-art technical equipment. High Speed Internet connection and W-LAN are available in all public areas of the hotel. We are passionate about creating the perfect ambience to help you to your success.